The statue of Lord Armstrong, situated at the junction of Barras Bridge and Claremont Road. Location: Barras Bridge/Claremont Road, Newcastle. Materials: Bronze and Sandstone. Status: Listed Grade II. 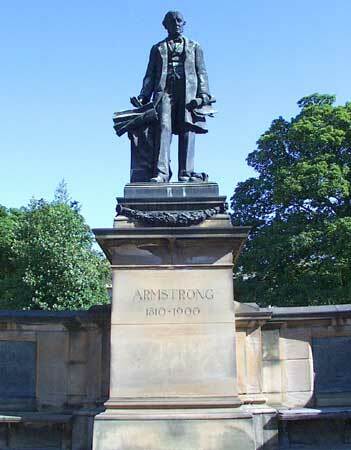 Two curved sandstone steps lead up to a tall square pedestal upon which stands the life-size figure of Lord Armstrong. The screen walls contain low reliefs illustrating the lowering of guns onto a ship and the Swing Bridge, the former celebrating Armstrong's massive munitions and shipbuilding empire with the latter his civil engineering achievements. William George Armstrong was born in 1810 in Shieldfield, Newcastle, the son of a corn merchant. The development of his works from four buildings making hydraulic machinery to a 230 acre site producing steel, ships, munitions and hydraulic equipment with a workforce of over 20,000 was the pre-eminent industrial achievement of Victorian Tyneside. Armstrong's own status and influence grew in parallel. Following the invention of the Armstrong Gun he was made engineer to the War Department and given the honour of a knighthood. He was raised to the peerage in 1887 and spent his final years at his country retreat 'Cragside' near Rothbury, dying in 1900. His benefactions to the City included the Mechanics Institute, a lecture hall at the Literary and Philosphical Society and Jesmond Dene. The position of the monument outside the Hancock Museum also marks his financial support of the museum.